George Wythe (pronounced “with”) was born in 1726 on his family’s plantation on the Back River in Elizabeth City County, Virginia. George’s father died when George was three years old, but fortunately, his grandfather had given his mother an excellent education, and George received his early education from her. She instilled in her son a love of learning that served him all his life. In his teens, Wythe entered the College of William and Mary in Williamsburg. He was poor, however, and his stay was necessarily brief. A family connection opened the door for him to study in the law office of Thomas Dewey, and at age twenty he was admitted to the bar. Admitted to the Virginia bar in 1746, moved to Spotsylvania County, and worked with the prominent lawyer Zachary Lewis. In 1747, Wythe married Zachary’s daughter Ann. Wythe was admitted to the York County bar January 16, 1748. Ann Lewis Wythe died on August 8 the same year. In 1755, George Wythe married Elizabeth Taliaferro (pronounced “Tolliver”). She was the daughter of respected planter and builder Richard Taliaferro, who built a dignified house on the Palace Green in Williamsburg – now called the George Wythe House. Taliaferro gave his daughter and her new husband life rights to the house, and they lived there for many years. Their only child died in infancy. At Williamsburg, Wythe immersed himself in further study of the classics and the law and achieved accreditation by the colonial supreme court. In 1755, George’s brother died and he inherited the family plantation, but George continued to live at Williamsburg, where he had been elected to represent the town in the House of Burgesses the previous year. He served in the House of Burgesses from the mid-1750s until 1775, first as delegate and after 1769 as clerk. In 1759, when Thomas Jefferson was a 16-year-old freshman at the College of William and Mary, he met George Wythe, then 35, a lawyer and member of the House of Burgesses representing the college. Jefferson’s father had died two years earlier, and Wythe and his wife, Elizabeth, who had no children of their own, took Jefferson in. Wythe first exhibited revolutionary leanings in 1764, when Parliament hinted to the colonies that it might impose a stamp tax. By then an experienced legislator, he drafted for the House of Burgesses a formal statement to Parliament so harsh that his fellow delegates modified it. Wythe was one of the first to express the concept of a separation of the colonies from the British empire. Yet, despite Virginia’s deepening disputes with the Crown, Wythe maintained close friendships with governors Francis Fauquier and Norborne Berkeley, baron de Botetourt. Wythe was appointed to William and Mary’s board in 1768, and was elected Williamsburg’s mayor on December 1 of that year. He was appointed clerk of the House of Burgesses July 16, 1767, and took the oath of office on March 31, 1768. He remained house clerk until 1775, when he was elected to the Second Continental Congress. Wythe continued to accept law students as boarders in his home, and treated them like the sons he never had. In 1772, he took James Madison (cousin of later President James Madison) into his home. Another student was Bermuda-born St. George Tucker, who later became United States judge for the District of Virginia. Among Wythe’s other law pupils were John Marshall, perhaps the greatest chief justice of the United States. But Wythe’s greatest pupil was Thomas Jefferson. The two men together read all sorts of material other than law; from English literary works, to political philosophy, to the ancient classics. Wythe also instilled in Jefferson a love for books. An avid collector, Wythe accumulated an excellent library. In later years, a friendly rivalry developed between Wythe and Jefferson, as each sought to develop the best private library in Virginia. As the War for Independence drew near, the controversies with Great Britain helped to crystallize Wythe’s thoughts on liberty. Wythe’s emphasis on the importance of liberty under the law helped to check Jefferson’s fiery spirit. 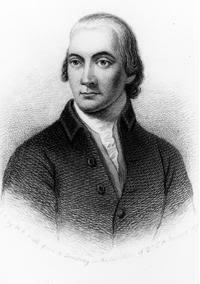 Wythe argued that due to the slowness of communications with England, the American legislatures should be allowed to make laws to meet local needs. The growth in power of the colonial assemblies was part of the whole process of the mid-1700s, which saw the lower houses grow in power, confidence, and ability to govern. Wythe’s mature political philosophy was similar to that of John Adams and James Madison. Wythe believed in the necessity of a “mixed government,” in which several “factions” checked each other’s power and influence. Ultimately, this concept found its practical expression in the three branches of government and in the relationship between the states and the national government. In 1776, at Wythe’s prompting, John Adams wrote his Thoughts on Government, in which he put forth the concept of separation of powers. When the war began, though 50 years old, Wythe volunteered for Virginia’s army, but was instead called to serve in the Continental Congress. In Philadelphia, Wythe emphasized that “we must declare ourselves a free people.” Following instructions from the Virginia Convention in Williamsburg, Richard Henry Lee, another member of the Virginia delegation, rose at the Second Continental Congress and moved for American independence. Thomas Jefferson’s Declaration of Independence was approved July 4, but the document was not ready for signing until August 2, 1862. By that time, Wythe had been called back to Virginia to help set up the new Commonwealth. Yet, George Wythe’s signature appears first among the Virginia signatories on the Declaration. He was so highly respected by his fellow Virginians that the other delegates left a space above their names so that Wythe could sign it when he returned. In 1777, George Wythe returned to Virginia to revise the colonial laws and adapt them to her new status as a sovereign state. Unlike the revolutionaries in France and Russia, Wythe sought to build American laws on English precedents, confirming Edmund Burke’s observation that “the Americans are not only devoted to liberty, but to liberty according to English principles and ideas.” Wythe clearly saw the danger of disinheriting America from the Magna Charta, the English Bill of Rights, and England’s unique contribution to the progress of liberty. George Wythe’s real love was teaching. In 1779, he accepted the appointment as professor of law and police in now-Governor Jefferson’s reorganization of the College of William and Mary. Wythe thus became the first professor of law in an American institution of higher learning. He held this position until 1790. In that position, he educated America’s earliest college-trained lawyers. 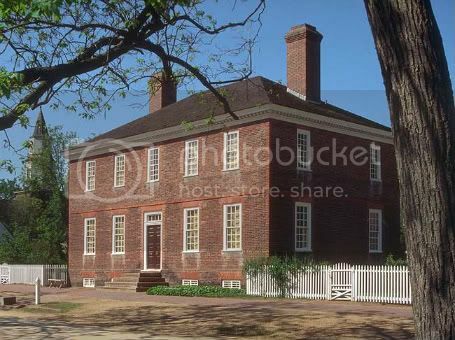 Elizabeth Taliaferro’s father gave his daughter and her new husband life rights to this house on Palace Green in Williamsburg, Virginia, and they lived there for many years. It also served as General George Washington’s headquarters just before the Siege of Yorktown. Wythe’s chief aim as an educator was to train his students for leadership. In a letter to his friend John Adams in 1785, Wythe wrote that his purpose was to “form such characters as may be fit to succeed those which have been ornamental and useful in the national councils of America.” Mr. Wythe’s School – both in his study and in the Wren Building at the College of William and Mary – produced a generation of lawyers, judges, ministers, teachers, and statesmen who helped fill the need for leadership in the young nation. During the Revolution, Wythe’s wealth suffered greatly. His devotion to public service left him little opportunity to attend to his private affairs. Due to the dishonesty of his superintendent, most of his slaves were placed in the hands of the British. But by cost-cutting and careful management, Wythe was able to pay off his debts and preserve his financial independence by combining what was left of his estate with his salary as chancellor. In 1787, Wythe was chosen to be part of the Virginia delegation to the Constitutional Convention, joining what Jefferson called an “assembly of demigods.” George Washington appointed Wythe along with Alexander Hamilton and Charles Pinckney to draw up rules and procedures for the Convention. Delegates from the American States met in Philadelphia and began framing the Constitution of the United States. George Wythe was among those illustrious patriots – yet he was in the convention for only ten days. He was called home by what he said was “the only” cause that “could have moved” him, the illness of his beloved wife. Elizabeth fell sick early in the summer, and on June 4, Wythe left the convention and headed back to Williamsburg. Despite his best efforts, Elizabeth Taliaferro Wythe died on August 14, 1787, “after a long and lingering sickness which she bore with the patience of a true Christian.” She was 47 years old, and had been his wife for more than 30 years. His wife gone, and having no children, Wythe once again answered the call of duty and fought for the passage of the Federal Constitution at the Virginia State Convention. Wythe’s prestige and influence, as well as the votes of five of his former students, helped to overcome strong opposition from the Antifederalists, led by Patrick Henry. Later, Wythe helped to develop the Bill of Rights, basing his work on George Mason’s Virginia Declaration of Rights. In a dispute with the administration, Wythe resigned from the college in 1789, and accepted an appointment as judge of Virginia’s Court of Chancery. In 1791, his chancery duties caused him to move to Richmond, the state capital, and he turned his home in Williamsburg over to the Taliaferro heirs. Wythe was reluctant to give up his teaching, however, and opened a private law school in Richmond. One of his last and most promising pupils was the future U.S. senator from Kentucky, Henry Clay. Wythe resigned as chancellor in 1792. Wythe had grown to hate slavery, and after his wife died in 1787, he began to free his slaves and to provide for their support. In Richmond, Wythe lived with two of his former slaves: his cook Lydia Broadnax, 66, and a 16-year-old mulatto boy named Michael Brown. Wythe was convinced that blacks were as intelligent as whites and, given the same opportunities, would be just as successful. Also living with him was his great-nephew George Wythe Sweeney, who was in line to inherit most of Wythe’s estate. The brash and irresponsible young man came and went as he pleased, and Wythe tried to exert a positive influence on him without much success. Sweeney was a regular at Richmond’s notorious gambling dens, and to pay his debts, he was not above selling books stolen from Judge Wythe’s library or forging his uncle’s name on checks. The judge finally threatened to cut his nephew out of his will if he didn’t change his ways. On Sunday morning May 25, 1806, Wythe followed his usual routine at his home in Richmond’s fashionable Shockoe Hill neighborhood. He doused himself with a bucket of ice-cold water from the well in his backyard, then returned to his room to dress and read the newspapers until Lydia Broadnax brought him his breakfast of eggs, toast, sweetbread, and hot coffee. When Sweeney discovered that Wythe had willed part of the family property to Broadnax and Brown, Sweeney had poured arsenic into the coffee that Wythe, Brown, and Broadnax drank. Richmond’s three most renowned physicians, James McClurg, William Foushee and James McCaw, all showed up to tend to the members of the Wythe household. The doctors were soon convinced that the symptoms exhibited by their three patients – sudden, severe stomach cramps, vomiting, diarrhea and acute pain – pointed to cholera. Cholera was often fatal within 48 hours, and as that deadline came and went, Broadnax began to recover, though the trauma she experienced permanently damaged her eyesight. Brown and Wythe remained in critical condition. Wythe insisted that he and his housemates had been poisoned by his ne’er-do-well 18-year-old grandnephew. On June 1, Michael Brown died. Wythe lived on in agony for two weeks. Gravely ill and overwhelmed with grief, Wythe sent for his lawyer and wrote his nephew out of his will. On June 2, Sweeney was arrested on forgery charges and incarcerated in the Henrico County jail. Wythe refused Sweeney’s request to post the $1000 bail. George Wythe died from the poison Sweeney had given him on June 8, 1806, at the age of eighty, and Richmond prepared an elaborate funeral, the largest held in the state’s history to that time. Hundreds of somber official mourners – members of Congress, state legislators, judges and lawyers – crammed the statehouse on June 11 for the eulogy. Businesses in the city shut down for the day, and thousands of Virginians quietly lined Main Street as the funeral procession passed. But one very important person was not in attendance: Because of slow mails, President Jefferson did not learn of his dear friend’s death until the day after the funeral. The president was also saddened by the death of Michael Brown, whom he had agreed to take in as a White House boarder if Wythe should die while the young man was still in his care. Wythe was buried at St. John’s Episcopal Church in Richmond, where Patrick Henry made his “Liberty or Death” speech. Wythe bequeathed his treasured collection of books to President Jefferson, adding to the collection that would form the basis of the Library of Congress in 1815. A grand jury indicted Sweeney for murder. Lydia Broadnax was thought to have been in the kitchen when the coffee was poisoned, but by Virginia law blacks could not testify against whites. Lydia was not allowed to tell the court that she saw Sweeney put something in the coffeepot the morning she and the others became ill.
That left the prosecution with a circumstantial case against Sweeney. After less than an hour’s deliberation, the jury returned a verdict of not guilty. However, disinherited and dishonored, Sweeney soon left Virginia and was never heard from again. George Wythe was perhaps the quintessential Founding Father. He was Virginia’s foremost classical scholar, dean of its lawyers, a Williamsburg alderman and mayor, a member of the House of Burgesses, and house clerk. He was the colony’s attorney general, a delegate to the Continental Congress, speaker of the state assembly, the nation’s first college law professor, and Virginia’s chancellor. No man ever left behind him a character more venerated than George Wythe. His virtue was of the purest tint; his integrity inflexible, and his justice exact; of warm patriotism, and, devoted as he was to liberty and the natural and equal rights of man, he might truly be called the Cato of his country. I had reserved with fondness, for the day of my retirement, the hope of inducing [Wythe] to pass much of his time with me. It would have been a great pleasure to recollect with him first opinions on the new state of things which arose soon after my acquaintance with him; to pass in review the long period which has elapsed since that time. 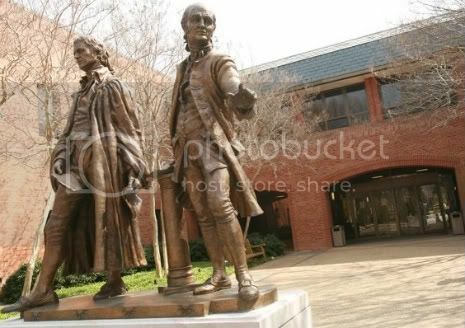 The namesakes of William and Mary’s affiliated law school, John Marshall and George Wythe (right), stand proudly in front of the law school, now ranked 30th in the US. Mary Osborn was born on August 8, 1736, at Fairfield, Connecticut, the daughter of Samuel and Hannah Osborn. Lyman Hall, son of John Hall and Mary Street Hall, was born April 12, 1724, in Wallingford, Connecticut, to a well-connected family. Lyman’s paternal grandfather, the Honorable John Hall, was a member of the Governor’s Council and a Justice of Connecticut’s Supreme Court. His maternal grandfather was the Reverend Samuel Street, Wallingford’s first pastor. Lyman went to Yale College and studied theology, graduating in 1747 at the age of 23. He also studied theology with his uncle, the Reverend Samuel Hall in Cheshire, Connecticut. He was called to pastor in 1749 in Stratfield Parish, now Bridgeport, Connecticut. Certain parishioners opposed him, and he was dismissed in 1751 after allegations were made against his moral character. For the next two years he continued to preach, substituting in vacant pulpits, while he also began to study medicine and teach. He went back to Yale, this time to the medical school. In 1752, Lyman married Abigail Burr of Fairfield, Connecticut, on May 20, 1752, but she died on July 8, 1753, at the age of 24. They had no children. Lyman graduated from Yale again in 1754; settled in his native town of Wallingford, and began his practice of medicine. Lyman Hall married Mary Osborn of Fairfield, Connecticut, on July 29, 1757. In 1757, the Halls migrated to South Carolina and established himself as a physician at Dorchester, a community settled by Congregationalist migrants from Dorchester, Massachusetts, who had arrived decades earlier. When these settlers moved south to Georgia’s coastal Midway District in St. John’s Parish, the Halls went with them. This area provided more land and a healthier climate – the inland plantations skirted malarial swamps. In 1758, the colonists finished their emigration and founded the town of Sunbury, Georgia, which evolved into the thriving seaport-hub of the surrounding slave-based, rice-indigo economy. The town was laid out on high, beautiful land facing the Midway River. Dr. Hall bought two of the nicest lots and built a summer residence there, as did many other planters. West’s Anne Lawler Ross depicts a seated woman outdoors, holding a book on her lap in her right hand and a flower in her left. Her costume includes a pear-shaped pearl, bow and lace at the bodice. Her almond-shaped eyes and simplified modeling are characteristic of West’s colonial portraits. Anne Lawler, born July 10, 1731, was the only child of Mary Lawler, a widow in Lancaster, Pennsylvania, who owned considerable property. George Ross was born May 10, 1730, in Newcastle, Delaware, where his father was clergyman of the Episcopal Church. His father was also twice married and had eleven children, all of whom became prominent members of society. George was well educated at home; then, at the age of eighteen, studied law at his older brother John’s law office in Philadelphia, the common practice in those days. George was admitted to the Pennsylvania bar, at the age of twenty, in 1750, and moved to Lancaster, Pennsylvania, where he set up a law practice. One of his first clients was Anne Lawler, a pretty young woman whom he fell in love with. 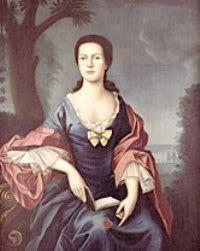 Anne Lawler married George Ross on August 14, 1751, and it was considered a highly advantageous union for both. Three children were born to George and Anne: George Jr., James, and Mary. George Jr., the eldest, was a staunch patriot during the Revolution and was for some time Vice-President of the Supreme Executive Council of Pennsylvania. In 1791, he was commissioned Register and Recorder by the Governor, an office he held for eighteen years. Ross built up a successful law practice in Lancaster. Initially a Tory (supporter of the British), he served as Crown Prosecutor for twelve years. He was elected to the Provincial Legislature in 1768; he was reelected many times, serving in that body even after he was chosen to be a delegate to the Continental Congress. Only Benjamin Franklin received a larger vote than Ross in the balloting. In the Legislature, Ross’s sympathies began to change, and he became a strong supporter of the colonies in their disputes with Parliament, and often opposed the Royal Governor. Anne Lawler Ross died May 30, 1773, and was buried at Saint James Church Cemetery in Lancaster, PA. In 1774, a provincial convention to which Ross had been elected sent him to the Continental Congress, and He served as a delegate to the First and Second Continental Congresses until 1777. The next year, he also served on the Committee of Safety. In 1775, because of his membership in the Continental Congress, he was removed from the British controlled provincial legislature. In 1776, Ross assisted in negotiating a peace treaty with the Indians in northwestern Pennsylvania. Abigail Carey was born in Bristol County, Rhode Island, on November 12, 1742, the daughter of Nathaniel and Elizabeth Wanton Carey. William Ellery was born in Newport, Rhode Island, to a wealthy mercantile family on December 22, 1727. His father, of the same name, was graduated at Harvard in 1722, became a successful merchant in Newport, and served successively as judge, senator, and lieutenant governor of the colony. Newport was then a unique community where despite many religious differences, there was a degree of tolerance. The elder Ellery prepared young William for college, and he entered Harvard in 1743. He was not enthused about becoming a merchant like his father, and entertained thoughts of being a lawyer. Ellery graduated in the Harvard class of 1747, and returned home to Newport. Annis Boudinot was born July 1, 1736, in Darby, Pennsylvania, to Catherine Williams and Elias Boudinot, merchant and silversmith, who later moved his family to Princeton, New Jersey. She was their eldest daughter and the second of ten children, though the first to be born in North America (her parents had just returned from Antigua where her father had run a plantation). The Boudinot family settled in Princeton, New Jersey. There Annis was exposed to the intellectual and social circles of the area, and her parents gave her a good education. She became particularly interested in poetry, an unusual pastime for a woman of that time, and published her first poem at age 16: To the Honorable Colonel Peter Schuyler, in the New-York Mercury and New American Magazine. Young Annis thrived in the town’s stimulating academic atmosphere, and became acquainted with Richard Stockton when her brother, Elias Boudinot, studied law in Richard’s office and married his sister, Hannah Stockton. Elias became a statesman from New Jersey, and was President of the Continental Congress in 1782 and 1783, and a signer of the Treaty of Paris, which ended the Revolutionary War. 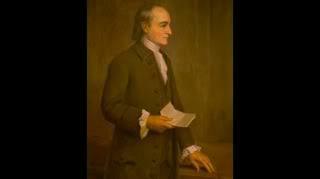 Richard Stockton, eldest son of John and Abigail (Phillips) Stockton, was born October 1, 1730. He was educated in the early years by Reverend Doctor Samuel Finley at Nottingham Academy in Maryland, and then attended the College of New Jersey (now Princeton University), graduating in 1748. He studied law under the honorable David Ogden of Newark, at that time the most eminent lawyer in the colony. Stockton was admitted to the bar in 1754, to the grade of counselor in 1758, and in 1763 he received the degree of Sergeant-at-Law the highest degree of law attainable. He opened his law practice in Princeton in 1754, and later another in Newark. He was Judge of the Supreme Court and a member of the King’s Council for New Jersey before the Revolution. Sometime in the late 1750s, Annis Boudinot married Richard Stockton, one of the most eloquent lawyers in the colonies. She was a woman of high character and patriotic spirit, which made her a fitting companion for the man who would soon devote his life to the cause of independence. Martha Wayles was born at The Forest in Charles City County – near Williamsburg, Virginia – on October 30, 1748. Her parents were John Wayles and his first wife Martha (Patsy) Eppes, wealthy plantation owners. 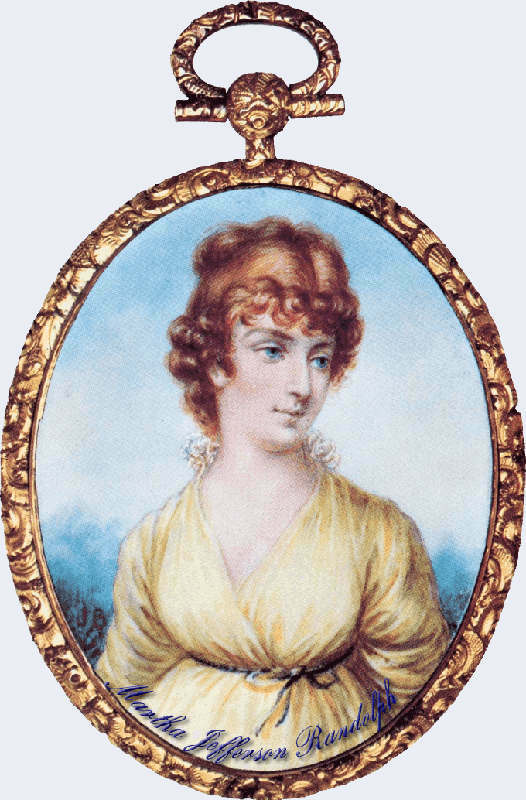 Martha’s mother was the daughter of Francis Eppes of Bermuda Hundred, a huge Virginia plantation. Patsy died when her daughter Martha was only three weeks old. No record of her early years exist but in light of her father’s wealth and prominence, Martha Wayles was likely educated at home by traveling tutors in literature, poetry, French, and Bible study; she likely received considerable training in music. Certainly a young woman of her region, era, and wealth would also be trained in sewing and medicinal preparations. Martha probably played a social role at the Wayles plantation; her later skills at Monticello would also suggest she received basic training on running a plantation, making household staples; she also assisted her father with management of crop business accounting. Martha Wayles married Bathurst Skelton in 1766; they lived at his Charles City County plantation and had one son, John Wayles Skelton. Bathurst Skelton died in September 1768 at Williamsburg after an accident, leaving Martha a rich widow, and she moved back into her father’s house. Thomas Jefferson was born on April 13, 1743, in Albemarle County, Virginia, the third child of Peter Jefferson, a surveyor, and Jane Randolph, daughter of a distinguished Virginia family. Their estate, Shadwell, was on the banks of the Rivanna River in the sparsely populated Piedmont Region, between the gentrified Tidewater coastline and the Blue Ridge Mountains of the frontier. Throughout his life, Jefferson would occupy a political and psychological space that balanced the responsibilities of establishment privilege with the lures of open, unexplored territory. In 1760, Jefferson entered the College of William and Mary in Williamsburg at the age of 16; he studied there for two years. At William and Mary, he enrolled in the philosophy school and studied mathematics, metaphysics, and philosophy. A keen and diligent student, according to the family tradition, and he frequently studied fifteen hours a day. In addition to his academic pursuits, young Thomas excelled as a horseman and violinist. After graduating with highest honors in 1762, he read law with George Wythe, Virginia’s most eminent legal scholar of that era, and was admitted to the Virginia bar in 1767. Jefferson handled many cases as a lawyer in colonial Virginia, more than a hundred each year between 1768 and 1773 in General Court alone, while acting as counsel in hundreds of cases. His client list included members of Virginia’s most elite families, including members of his mother’s family, the Randolphs. Sometime in 1770, probably in Williamsburg, Martha Wayles Skelton – the widow of Jefferson’s classmate at William and Mary, Bathurst Skelton – met a rather shy attorney and scholar named Thomas Jefferson, who was then serving in the House of Burgesses. When Jefferson began courting her in December 1770, she was living again at The Forest with her young son, John, who died suddenly of a fever on June 10, 1771, when she was already engaged to Jefferson. Family tradition says that Martha was accomplished and beautiful – slender figure, hazel eyes, and auburn hair – and wooed by many. Jefferson found Martha especially attractive because of her education and her penchant for music. Throughout their courtship in 1770 and 1771, the young couple frequently harmonized together, she singing while he played accompaniment on piano. Martha married Thomas Jefferson on New Year’s Day, 1772, at the bride’s plantation home, The Forest, near Williamsburg. The Jeffersons honeymooned there for two weeks before setting out in a two-horse carriage for a cottage on the property that would become Monticello, though the mansion house was not yet built. They made the 100-mile trip in one of the worst snowstorms ever to hit Virginia. Some miles from their destination, their carriage bogged down in two feet of snow, and they had to complete the journey on horseback. Abigail Adams (1744-1818) was the wife of President John Adams, the mother of President John Quincy Adams, and the second First Lady of the United States. As the Second Continental Congress drafted and debated the Declaration of Independence, Abigail began to urge John in her letters that the creation of a new form of government was an opportunity to make the legal status of women equal to that of men. The text of those letters became some of the earliest known writings advocating women’s rights. Abigail Smith was born on November 11, 1744, at Weymouth, Massachusetts to the Reverend William and Elizabeth Smith. On her mother’s side, she was descended from the Quincys, a well-known political family in the Massachusetts Bay Colony, and a cousin of Dorothy Hancock. The Smith home was busy and active – visitors came often and relatives lived nearby. Sherman did not pose for Earle – he was incapable of “posing” for anyone – he quite literally “sat” for him, and the result is one of the most striking portraits of the age. Rebecca Minot Prescott (1742 – 1813) was born in 1742. She was the daughter of Benjamin and Rebecca Minot Prescott from Salem, Massachusetts, and the niece of Roger Sherman’s brother, Reverend Josiah Sherman. Roger Sherman was born at Newton, Massachusetts, on April 19, 1721, to a poor farming family. In 1723, he moved with his parents to what was then a frontier town, Stoughton, which was seventeen miles south of Boston. Roger’s education was very limited, but he had access to his father’s library, a good one by the standards of the day, and when Roger was about thirteen years old the town built a grammar school, which he attended for a time. Roger was first cousin twice removed of Eli Whitney, inventor of the cotton gin. Roger was blessed with an active thirst for learning, and Stoughton was fortunate to have a parish Minister by the name of Reverend Samuel Danbar, who had been educated at Harvard. The reverend took young Roger under his wing, and helped him acquire some knowledge of mathematics, sciences, literature, and philosophy. At Stoughton, Roger’s father had carved out a farm in the wilderness. To help earn additional money, his father also made shoes, and young Roger was taught the shoemaking trade at an early age. As a boy, he read widely in his spare time, but he spent most of his waking hours helping his father with farming chores and making shoes. After his father’s death in 1743, Roger Sherman moved with his mother and siblings to New Milford, Connecticut, where an elder brother was living. For a time, Roger continued to farm and make shoes. Then, in partnership with his brother, Roger opened the town’s first store, and rapidly became one of the town’s leading citizens. He also used his mathematical skills and studied to become a surveyor. In 1745, he was appointed surveyor of New Haven County, Connecticut, and served in this capacity until 1758. During that time, he bought a considerable amount of land, and became active in the affairs of New Milford, serving as juryman, town clerk, church deacon, school committeeman, and agent to the Assembly of Town business. Although he had no formal legal training, Sherman was urged to read for the bar by a local lawyer, and he was accepted to the Bar of Litchfield, Connecticut, in 1754. He was elected to represent New Milford in the Connecticut General Assembly from 1755 to 1758 and from 1760 to 1761. Sherman also began providing astronomical calculations for almanacs in 1748. Since New Milford had no newspaper and reading material was hard to come by, Sherman wrote and published a popular Almanac of his own from 1750 to 1761. By the age of 40, he had become a very successful landowner and businessman, while integrating himself into the social and political fabric of New England. Mary Walton came from a notable family of New York merchants. Her father was Jacob Walton who had married Maria Beekman, daughter of Dr. Gerardus Beekman. With his brother William, Jacob carried on the business that had been founded by their father. Lewis Morris, the third Morris to be named Lewis, was born in New York in 1726, the eldest son of Lewis and Catherine (Staats) Morris. His father was the second lord of the vast manor of Morrisania. His great grandfather, Richard Morris, had purchased the first tract of land in southwest Bronx that became the basis for the Morrisania manor. Upon graduating from Yale College in 1746, Lewis returned to his father’s residence, where he devoted himself to the pursuits of agriculture and helped manage the estate. On September 24, 1749, Lewis Morris married Mary Walton, enhancing his already great fortune. They had ten children, six sons and four daughters: Catherine, Mary, Lewis, Jacob, Sarah, William, Helena, James, Staats, and Richard. Sons, Lewis, Jacob, and Richard fought in the Revolutionary War, and son William served as aide-de-camp to General Anthony Wayne. Mary Walton Morris was an eminently capable woman, and notwithstanding her wealth and social position, was a well-trained and thrifty housewife. She actively entered into the rural life that her husband had chosen for them. After his father died In 1762, Lewis, the eldest son, inherited Morrisania and became its third lord. He devoted himself to the management of his large estate and became a successful farmer. About this time, he gained an interest in local politics, and in 1769 served a term in the colonial legislature. Sarah Hatfield was born in 1728, the eldest daughter of Isaac and Sarah Price Hatfield, a farming family in Elizabethtown, New Jersey. Abraham Clark was born February 15, 1725, and in his boyhood, he was too frail for farm work. His father, Thomas Clark, realized that Abraham had a natural gift for mathematics, so he hired a tutor to teach Abraham the profession of surveying. Clark’s love of study, and the generosity of his character, naturally made him popular – his opinion was valued, and often sought. He was called to fill various offices, the duties of which rendered himself highly useful in the community in which he lived. While working as a surveyor, he taught himself law and went into practice. He became quite popular and became known as the poor man’s councilor, because he offered to defend poor men when they couldn’t afford a lawyer. Abraham Clark married Sarah Hatfield in 1748, with whom he had ten children: Aaron, Thomas, Abraham Jr., Hannah, Andrew, Sarah, Cavalier, Elizabeth, Abraham Clark III, and Abigail. It is said that Sarah was an intrepid and resourceful women, whose care and devotion allowed her husband the opportunity for decades of public service. She ran the family farm and reared their ten children. The Clarks attended the First Presbyterian Church of Elizabethtown, where her father was an Elder. Clark followed his father’s example by taking an active part in civic affairs. He entered politics as a clerk of the Provincial Assembly. Later he became High Sheriff of Essex County, and in 1775 was elected to the Provincial Congress. He was also a member of the Committee of Public Safety. Between 1774 and 1776, he attended several Revolutionary conventions, and won election to the provincial assembly. In whatever capacity he acted as a public servant, he attracted the respect and admiration of the community, by his punctuality, his integrity, and perseverance. Early in the American Revolution, Clark was highly vocal on his opinion that the American colonies should have their independence. Early in 1776, the New Jersey delegation to the Continental Congress opposed independence from Great Britain. As the issue heated up, the state convention replaced all their delegates with men who favored separation from the mother country. On June 21, 1776, they appointed Abraham Clark, along with John Hart, Francis Hopkinson, Richard Stockton, and John Witherspoon as new delegates. Clark was well aware, as were his fellow congressional delegates, of the gravity of the decision for independence from Great Britain. He knew full well that fortune and individual safety were at stake, but personal considerations did not compare to the honor and liberty of his country. Clark was prepared to risk everything he held dear for freedom from British tyranny. Abraham Clark arrived in Philadelphia on June 28, 1776, and a few days later, he was called upon to vote for, or against, the proclamation of independence. On July 2, 1776, he voted for the Declaration of Independence, and affixed his name to that sacred document, determined to meet the consequences of that noble but dangerous act with fortitude and resolution, becoming a free born citizen of America.